Colt’s manufacturing has made several versions of their lower receivers and you must determine which one you have before purchasing/installing the JPFCP-EZ kit. 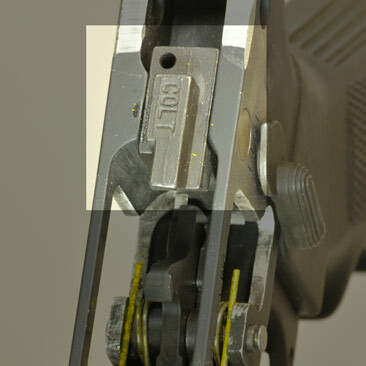 First, measure the pins in your Colt lower to determine if they are .154 or the .169 in diameter. Only .169 pins will be compatible with the JPFCP-2EZ kit. Use the JPFCP-1EZ kit for a receiver with .154 pins. Second, verify that your lower receiver has the machined-in wall feature used in newer Colts and not the pinned-in full auto sear block common to older Colt models. If your receiver has the pinned-in block, the JP EZ Trigger will not be compatible (see below). If this is the case, then please contact us directly to either purchase our discontinued JPFCP-2 kit or arrange to have the kit professionally installed by our gunsmiths and returned shipped for $220 with a one-week turn around.